When meeting Carmen, you can immediately recognize her drive and determination to provide a better life for her family. While steadily employed, Carmen’s income proved no match for San Diego’s high cost of living once she gave birth to her daughter, Cristina. Unable to afford her own apartment, Carmen never stopped trying to provide a stable home for her family. She applied to multiple public affordable housing programs and was placed on a decades-long waiting list. Undeterred, Carmen raised her bright and precocious daughter for years in shared living situations by renting rooms in apartments. However, after unexpectedly losing her job, Carmen was unsure where to turn. She remained on long waiting lists for public affordable housing and was running out of options. Carmen found herself staying on the couches of family members, but was never sure of how long their generosity would last. “I felt invisible and that no one cared about us,” shared Carmen. 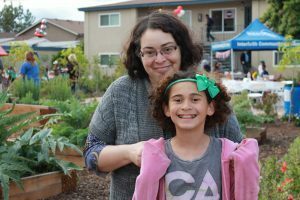 Facing imminent homelessness, Carmen came to Interfaith Community Services seeking nutrition assistance to provide healthy meals for her daughter. Remembering the defeat of long waiting lists, she was reluctant to even inquire about Interfaith’s housing services. At the urging of Interfaith’s front desk staff, Carmen attended a housing information session and applied for the Family Housing Program. Soon after, Interfaith’s Director of Housing called with life-changing news: Carmen and Cristina could move into their own home. “I just started bawling and sobbing tears of joy. When everyone else had said no, Interfaith said yes,” recalled Carmen. No longer faced with the threat of homelessness, Carmen and Cristina were quickly placed into their own transitional housing apartment. “Coming to Interfaith and having our own space, we were so excited. It is more space than we ever had in our lives,” remembered Carmen. Cristina is also overjoyed to be in her new home and is now hosting sleepovers with her friends for the first time. “When we got the keys for the first time I had to take a picture of them. We felt like it was Christmas. It is Christmas everyday now,” laughed Cristina. With Carmen and Cristina finally in a home to call their own, the Family Housing Program worked to improve the family’s self-sufficiency through classes and workshops. “I have learned new skills to help me save time and money. I now know it does not have to be that difficult to cook healthy meals and stay organized,” said Carmen. Taking advantage of all the support offered by the Family Housing Program, Carmen has gained employment with a local school district and can now provide a steady paycheck to support her family. Moreover, Carmen and Cristina now have a forever home to call their own as they were recently placed into one of Interfaith’s permanent affordable housing units. “I now have a safe place us. It just brings you peace of mind to have your own home,” said Carmen. Carmen and Cristina’s journey is just one example of how the Housing 1000 program changes lives. To learn about how you can get involved and contribute to the campaign today, please contact Robert Adams, Chief Development Officer, at radams@interfaithservices.org or by calling (760) 489-6380 ext. 206.